Deep vein thrombosis (DVT) of the lower extremities is a common disease in clinical practice. The incidence of DVT has continued to rise. Pulmonary embolism (PE) is the most serious and life-threating complication caused by thromboembolism. Inappropriate treatment of acute DVT can result in thrombus organization and post-thrombosis syndrome (PTS) in at least one-third of patients, seriously affecting their quality of life . A variety of clinical treatments for DVT has been reported and achieved good outcomes. AngioJet™ rheological mechanical thrombectomy devices can quickly remove thrombi of the lower extremities and reduce the incidence of PTS. In this study we retrospectively analyzed the clinical data of 14 patients undergoing AngioJet™ mechanical thrombectomy in our hospital. A total of 14 patients with acute DVT were admitted and treated in our department between January 2016 and September 2016. The duration after onset was from one to five days. There were eight males and six females, with a mean age of 51.4 ± 15.5 years (range: 27 to 75 years). The diagnosis of DVT was confirmed by venous ultrasound. The patients were placed in the supine position, and vein puncture using the Selinger technique was performed in the contralateral femoral vein after local anesthesia. A 4F catheter sheath was placed, and a 4F pigtail catheter was used for angiography of the bilateral renal vein. The openings of the renal veins in the inferior vena cava were located, and a temporary filter was implanted at the level below the openings of the renal veins. Then, anterograde venography was performed via the dorsal vein of the affected lower extremity to identify the location of the thrombus. Central DVT in ten patients and mixed type DVT in four patients were confirmed. For four patients, a 6F "Crosseover™ sheath" was used to replace the 4F catheter sheath, and a 0.035 inch ultra-smooth guidewire and a Cobra catheter were used to access the iliacfemoral vein of the affected side. The other ten patients were placed in a prone position, and a 6F catheter sheath was placed in the popliteal vein. A 0.035 inch ultra-smooth guidewire and a single-curved catheter were used to access the thrombosed vessels. After accessing thrombosed vessel, a 6F AngioJet™ thrombectomy catheter was introduced to the thrombosed site over a 0.035 inch, 260 cm long, ultra-smooth and rigid guidewire (Boston Scientific Corporation, 6F Solent™ Omni). In four patients, urokinase solution (urokinase 250,000 IU in 100 ml saline) was administered in the thrombus. After 15 minutes, 6F AngioJet™ thrombectomy catheter was used to aspirate and remove the thrombus. In the other ten patients, the thrombus aspiration started directly with perfusion solution (unfractionated heparin 5,000 IU in 500 ml saline). Angiography was performed immediately after thrombectomy. If residual thrombi were considerable, the thrombectomy could be repeated. The mean operative time was 298.5 ± 95.2 seconds (range: 162 to 480 seconds). Three patients underwent balloon angioplasty alone, and five patients underwent stent implantation (Figure 1). Two patients did not receive stent implantation because they could not afford angioplasty treatment. The patients returned to the ward and received thrombolytic therapy (250,000 IU/bid, pump infusion for 1 h) via the dorsal vein of the affected lower extremity for 2-3 days. Aspirin and low molecular weight heparin were also added. Figure 1: The procedure in the treatment of deep venous thrombosis by AngioJet™ thrombectomy system and stent implantation; A-C). Angiography shows total occlusion of Iliac vein and femoral vein; D). Angiography shows femoral vein thrombosis completely removed after percutaneous AngioJet™ thrombectomy; E). Angiography shows iliac vein recanalization and residual stenosis; F). Angiography shows iliac vein patency after stent implantation. After discharge from the hospital, anticoagulant therapy with warfarin was used for a minimum of six months. The patients were periodically re-evaluated via a coagulation test. Warfarin dose was adjusted based on a prothrombin international normalized ratio (INR) test to maintain the range of INR between 1.8 and 2.5. Patients undergoing stent implantation received antiplatelet therapy with aspirin for a minimum of one year. A compression stocking was worn on the affected lower extremity as soon as ambulation was allowed. Urinary catheters were placed prior to surgery, a 0.9% sodium chloride solution was administered one hour before the surgery, and 5% NaHCO3 solution was administered 30 minutes before thrombectomy. If hemoglobinuria was present during surgery, the volume of intravenous fluids and electrolytes were increased after surgery. The amount of sodium bicarbonate solution was increased for urinary alkalization depending on urinary output of the patient. Diuretic furosemide was used concurrently for diuresis if needed. Urine output and changes in urine color were documented. Routine blood and urine tests and biochemistry profiles were repeated within 24 h.
Venous Doppler ultrasounds of the lower extremity were performed, and D-dimer levels were measured at the one, three and six month follow-up visits after the patient was discharged. SPSS 23.0 statistical software was used for statistical analysis. Quantitative data are expressed as x ± s and tested with paired sample t-tests. P<0.05 was considered significant. Complete recanalization (grade III) was achieved in 12 patients with venous thrombosis, and near-complete recanalization (grade II) was achieved in two patients. The evaluation criteria for the effectiveness of the thrombectomies were as follows: thrombus clearance >90% was defined as grade III, 50%-90% as grade II, and <50% as grade I . Of the patients with residual iliac vein stenosis, eight patients underwent balloon angioplasty and five patients underwent stent implantation. Swelling of the lower extremity subsided after surgery. All patients were followed for 1 to 10 months, with an average of 7.64 ± 2.02 months. During follow-up, we found no swelling in the affected limbs in 10 cases, mild swelling after exercise in 3 cases, and severe swelling in 1 case. One patient had recurrent swelling of the lower extremity limb which was resolved after an iliac vein stent was implanted. No thrombus recurrences of previously affected vessels were reported in the remaining patients. 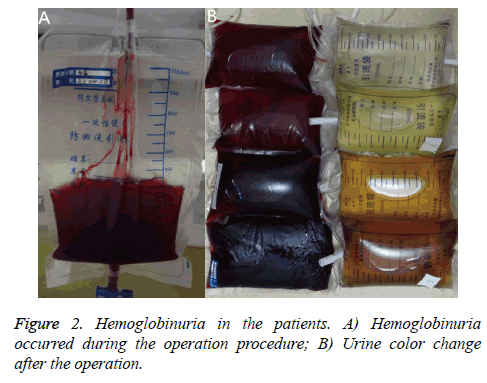 Gross hemoglobinuria was present in eight patients, but urine color returned to normal within 24 h after surgery (Figure 2). No complications, such as serious renal dysfunction, bleeding and severe pulmonary embolism, were reported. No any patients showed anemia symptoms such as pallor in the skin and mucous membranes. Figure 2: Hemoglobinuria in the patients. A) Hemoglobinuria occurred during the operation procedure; B) Urine color change after the operation. Preoperative and postoperative 24 h levels of blood BUN, creatinine, and serum potassium showed no significant changes (P>0.05). Preoperative and postoperative 24 h levels of erythrocyte count, hemoglobin, and urine red blood cell showed significant changes (P<0.05) (Table 1). A: preoperative; B: postoperative. *P<0.05 compared with their respective controls. Table 1. Changes of urine and blood indexes before and after operation. Currently, DVT interventional therapy includes transcatheter thrombolysis, mechanical thrombectomy, percutaneous transluminal angioplasty (PTA) and stent implantation. AngioJet™, a rheological mechanical thrombectomy device, utilizes luminal high-speed flow of liquids to create a low pressure zone around the catheter. The targeted thrombus is drawn into the catheter under negative pressure and is impinged upon by a high-speed flow of water and removed from the body. This device quickly reduces thrombus burden, relieves symptoms and greatly reduces the risk of bleeding, the average length of hospital stays, and the overall costs of treatment . With the wide use of this technique, AngioJet™ has been increasingly employed for the treatment of peripheral venous thrombosis and its reliability and safety have been clinically approved. A multicenter prospective study showed that AngioJet™ resulted in grade II thrombus clearance in 96% of 329 cases of thrombus patients. Only one case of acute renal impairment and one case of transient renal dysfunction were reported . Bush et al. used AngioJet™ to treat 23 patients with acute DVT and reported complete clearance in 65% of patients without serious complications . In this study, 14 patients underwent AngioJet™ thrombectomy. Swelling of the affected extremity subsided after surgery. The therapeutic effect was satisfactory, and no serious complications related to surgery were reported. AngioJet™ mechanical thrombectomy catheter can be concurrently used for angiography, urokinase thrombolysis injection, and thrombus evacuation. The operation is very simple. The jet mode can increase the contact area between urokinase and the thrombus to improve thrombus clearance and reduce the dose of urokinase. Additionally, the device can be used to locate the thrombus during angiography and clear the thrombus without changing the catheters. Furthermore, this device can be used repeatedly for thrombus aspiration and reduce the operation time . In this study, the duration of onset was within five days in all patients. Thrombus aspiration was started directly in 11 patients and achieved good results. The operative time and the incidence of intravascular hemolysis caused by mechanical damage were reduced. Urokinase injections for thrombolysis were used in other four patients. All patients received thrombolytic therapy with urokinase via the dorsal vein of the affected lower extremity for 2-3 days. Compared to thrombolytic therapy with urokinase via conventional catheters, the dose of urokinase and the treatment duration were reduced. Moreover, indwelling venous sheaths were not necessary, and therefore, patients had early ambulation, which reduces the occurrence of catheter-related infections and other complications. For patients with DTV complicated with iliac vein compression or occlusion, concurrent PTA and stent implantation may be effective treatments after thrombectomy to improve the efficacy and reduce the risk of thrombosis recurrence . In this study, eight patients underwent PTA and/or stent implantation. Postoperative angiographies showed that the affected vessels were completely restored to normal based on radiographic assessment. In contrast, one of the two patients with vein compression who did not receive PTA experienced recurrent swelling of the lower extremity three months after discharge. The repeated angiography revealed complete occlusion of previously compressed vein segments and the formation of collateral circulation. The occluded segments were treated with angioplasty to restore blood flow. During AngioJet™ thrombectomy, the high-speed water jet and mechanical damage caused by the catheter can destroy red blood cells. Intravascular hemolysis could also be observed due to the release of large amounts of free hemoglobin. Hemoglobinuria will be observed when the globin binding capacity to free hemoglobin is saturated. Inappropriate perioperative treatment can cause acute renal impairment. Dukkipati et al. reported cases with impaired renal function after AngioJet™ PMT . Perioperative hydration with considerable amounts of fluids, urine alkalization, and diuresis can reduce the occurrence of renal damage. We found that patients immediately presented with hemoglobinuria if rich blood flow had been present in the segments treated by AngioJet™ mechanical thrombectomy. Urine color was increasingly darker, and urine output increased with prolonged operative time. Conversely, patients may not present with hemoglobinuria if no or poor blood flow was present in the segment. This phenomenon indicated that blood flow around the thrombus and the initial location of the AngioJetTM catheter may be sufficient conditions for hemoglobinuria. In response, we improved the operative approach. By means of the popliteal vein approach, the AngioJet™ catheter can anterogradely advance to the distal end of a venous thrombus and start aspiration until the proximal end of the thrombus is removed. This approach can greatly reduce erythrocyte mechanical damage and thereby dramatically decrease the possibility of postoperative hemoglobinuria. Furthermore, thrombectomy operative time may affect the probability of the occurrence of hemoglobinuria. In this study, to completely remove the thrombus, the thrombectomy operative time reached or nearly reached a maximum limit according to the product manual. Margheri et al. showed that reduced operative time could reduce the risk of renal dysfunction . Nazarian et al. demonstrated that exponential correlations rather than linear correlations existed between the incidence of hemoglobinuria after the use of a mechanical thrombectomy device and the operative time . Therefore, it is important to control the operative time when removing thrombi in blood flow. Among the 14 patients included in this study, hemoglobinuria was present in eight patients. The incidence of hemoglobinuria was approximately 57.1%. Serum creatinine and blood urea nitrogen were not significantly different before and after surgery. No presence of oliguria or anuria was reported. In summary, mechanical thrombectomy device AngioJet™ can quickly remove thrombi, relieve lower extremity swelling, reduce the dose of urokinase and anticoagulants, reduce bleeding rates, surgical risks and the incidence of PTS, and improve the quality of life of patients. This device is particularly useful for patients with high risk or contraindications for thrombolytic agents. Srinivas BC, Patra S, Nagesh CM, Reddy B, Manjunath CN. Catheter-directed thrombolysis along with mechanical thromboaspiration versus anticoagulation alone in the management of lower limb deep venous thrombosis-a comparative study. Chest 2014; 146: 247-254. Lin PH, Zhou W, Dardik A, Mussa F, Kougias P, Hedayati N, Naoum JJ, Sayed H, Peden EK, Huynh TT. Catheter-direct thrombolysis versus pharmacomechanical thrombectomy for treatment of symptomatic lower extremity deep venous thrombosis. Am J Surg 2006; 192: 782-788. Han K, Ko HK, Tsauo J, Shim DJ, Kim Y, Ko, GY, Han DJ, Shin S, Kim YH. Endovascular management for the treatment of pancreas transplant venous thrombosis: a single-center experience. J Vasc Interv Radiol 2016; 27: 882-888. Garcia MJ, Lookstein R, Malhotra R, Amin A, Blitz LR, Leung DA, Simoni EJ, Soukas PA. Endovascular management of deep vein thrombosis with rheolytic thrombectomy: final report of the prospective multicenter PEARL (Peripheral Use of AngioJet Rheolytic Thrombectomy with a variety of catheter lengths) Registry. J Vasc Interv Radiol 2015; 26: 777-785. Bush RL, Lin PH, Bates JT, Mureebe L, Zhou W, Lumsden AB. Pharmacomechanical thrombectomy for treatment of symptomatic lower extremity deep venous thrombosis: Safety and feasibility study. J Vasc Surg 2004; 40: 965-970. Ierardi AM, Xhepa G, Piffaretti G, Bacuzzi A, Tozzi M, Carbone M, Barile A, Squillaci E, Fonio P, Brunese L, Carrafiello G. Clinical experience with Angiojet: a comprehensive review. Int Angiol 2015; 34: 1-14. Ahmed O, Ng J, Patel M, Ward TJ, Wang DS, Shah R, Hofmann LV. Endovascular stent placement for May-Thurner Syndrome in the absence of acute deep vein thrombosis. J Vasc Interv Radiol 2015; 27: 167-173. Dukkipati R, Yang EH, Adler S, Vintch J. Acute kidney injury caused by intravascular hemolysis after mechanical thrombectomy. Nat Clin Pract Nephrol 2009; 5: 112-116. Margheri M, Vittori G, Vecchio S, Chechi T, Falchetti E, Spaziani G, Giuliani G, Rovelli S, Consoli L, Zoccai GGL. Early and long-term clinical results of AngioJet rheolytic thrombectomy in patients with acute pulmonary embolism. Am J Cardiol 2008; 101: 252-258. Nazarian GK, Qian Z, Coleman CC, Rengel G, Castaneda-Zuniga WR, Hunter DW, Amplatz K. Hemolytic effect of the Amplatz thrombectomy device. J Vasc Interv Radiol 1994; 5: 155-160.